Perhaps you beg to differ, but I can assure you that every single capital letter and exclamation mark in this title is justified. Booster has a spot-on selection of good-quality shoes (and frankly, who doesn’t love shoes?) for ladies and gents, mostly European brands, at reasonable prices. Boxes and boxes of different sizes and colours are stacked on top of each other, which is fun if you need to pull out your size from the bottom of the pile. Alas, the friendly staff is ready to help you out in your clumsiness-induced misery. 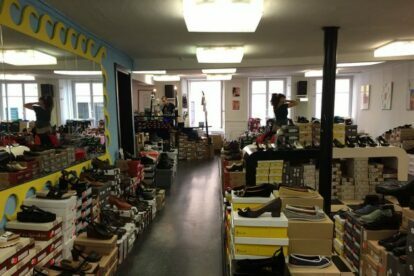 You will find the Booster shoe paradise on the shop’s first floor, while the ground floor is dedicated to funky clothes which appeal not only to the rockabilly crowd that frequents the place. Once you are done with your shoe shopping shenanigans you can find Café Henrici diagonally opposite to kick back, relax and plan your next venture. Putting on your dancing shoes, perhaps?